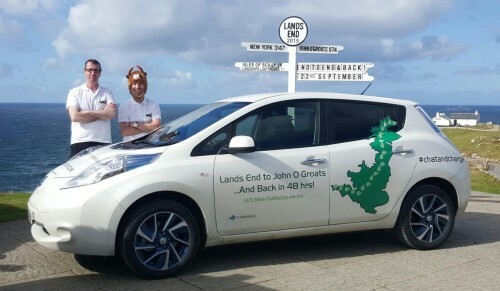 Taking just over two days to finish the 1,652-mile journey, Chris Ramsey and Jonathan Porterfield, both from Scotland, used only publicly available EV charging points, taking advantage of the UK’s growing charging network, comprising more than 7,000 charging stations. Many of the charging points that the pair visited form part of Ecotricity’s Electric Highway – Europe’s largest rapid charger network. These chargers are entirely free to use and are powered by renewable energy sources such as wind and solar power. The Nissan LEAF was ‘refuelled’ 33 times along the Electric Highway with each charge taking as little as half an hour. Chris and Jonathan, who are both members of EV enthusiast group Plug In Adventures, took on the challenge to highlight the breadth and scale of charging infrastructure in the UK and to prove the capability and practicality of electric cars. The first leg of the journey from John O’Groats to Land’s End was completed in just 28 hours and 38 minutes, a time that the pair believed to be a new record, and this was quickly beaten when the duo achieved the return journey in just 27 hours 47 minutes. Chris said: “Being a LEAF owner and knowing its capabilities, the result was never in doubt. The most important thing was demonstrating in a unique and different way that EVs and the existing infrastructure can easily meet the needs of every day drivers. Robert Tweedie, EV Manager, Nissan Motor (GB) Ltd said: “What Chris and Jonathan achieved was pretty extreme but it’s yet more proof of the capability, performance and reliability of the Nissan LEAF. “Of course most drivers will never undertake a journey like this and the vast majority of owners will only ever need to charge their car once or twice a week to handle their daily commute. Plug In Adventures was founded by Chris in 2011 and was born from a combined love of adventure and electric vehicles. Comprising a group of EV enthusiasts based in Scotland, its aim is to engage with the public in unique and different ways, championing all things EV-related. Follow @Pluginadventure on Twitter for all of the latest from the team. The Nissan LEAF is the best-selling pure electric vehicle with almost 200,000 on the road globally. Earlier this month, the new Nissan LEAF 30kWh debuted at Frankfurt Motor Show, delivering 155 miles on a single charge, up 25% on its predecessor. To find out more about Nissan’s electric vehicle range, visit: www.nissan.co.uk or to find out more about Ecotricity’s Electric Highway, visit: www.ecotricity.co.uk.